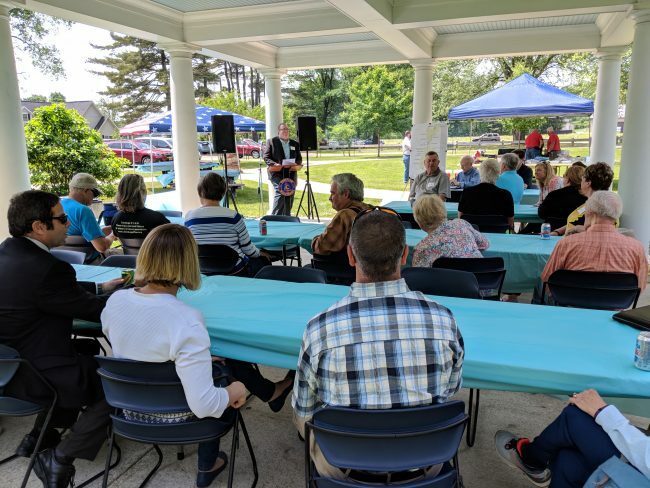 The Champlain Canalway Working Group held an early celebration of National Trails Day with a picnic lunch today for elected officials, trail volunteers and planners. The gathering of 40 trail advocates met in beautiful Lighthouse Park on the Hudson River, located on Route 4 in Halfmoon, NY, to share news on local progress towards the long-held vision of a complete 62-mile trail along the Champlain Canal and Hudson River extending from Waterford to Whitehall. The Town of Halfmoon provided a barbeque luncheon and Saratoga PLAN and trail volunteers contributed homemade side dishes for the picnic, after which the group toured a completed section of the Champlain Canalway Trail in the town of Halfmoon. Kevin Tollisen, Town of Halfmoon Supervisor, said that planning and permitting for the final section of the canalway trail in the town, Phase 4, is being designed and permitted this year, and it will be ready for construction to start in 2019, with completion by the end of 2020. Mechanicville Supervisor Thomas Richardson, talked about how the canalway trail will connect with other parts of the county. 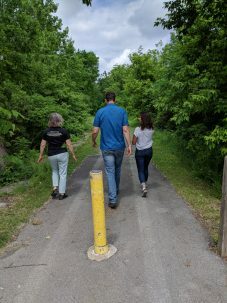 Segments being worked on this year will complete the connections from Halfmoon to the Stillwater line and westward to the Zim Smith Trail, which connects all the way to Ballston Spa. Ed Kinowski, Stillwater Supervisor, said, “We’re not building a trail, we’re just recreating and naming it.” He noted how much of the current canalway route follows the canal towpath and traditional trail routes used in Colonial times and by Native Americans. Saratoga PLAN is working closely with the Town of Stillwater to make the final connections that will take the trail north to the Saratoga National Historical Park. PLAN is donating a canalside property to the town, and the town has purchased a “trailblazer” machine for cutting and leveling the trail route. A vision for developing the old Champlain Canal, where it passes through Schuylerville, was discussed, and Julie Stokes said they have asked the U.S. EPA about “rewatering” the canal. Stokes, along with other volunteers in attendance have been working for nearly five decades toward the vision of a complete canalway trail and interconnected trail network throughout Saratoga County. Saratoga PLAN Executive Director Maria Trabka, added, “It’s really exciting to see all the connections between the river and our communities and trails, and the network is becoming a really, nice complimentary system of blue and green trails.” She recognized the wide variety of visionary supporters in attendance who helped create the ideas and have put the shovels in the ground, from town supervisors and mayors, to planning boards and professional consultants, to town employees, to private contractors, to the many extraordinary volunteers. “The assemblage at this picnic is a testament to the persistence and diversity of community members who can accomplish great things when they work together. We thank them all,” she said.